Being the peanut butter lover I am I knew I would love this sauce. Add it to noodles and veggies and this was a dinner I could never get tired of. Pour the sauce over rice or pasta, beans, and veggies. 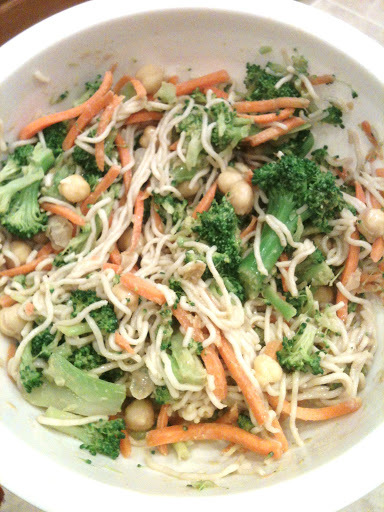 I used this sauce over thin noodles with carrots, broccoli, and chickpeas. This is such a great meal. It has healthy fats, carbs, and veggies! This entire sauce recipe yields approximately 140 calories and 4.5g protein. 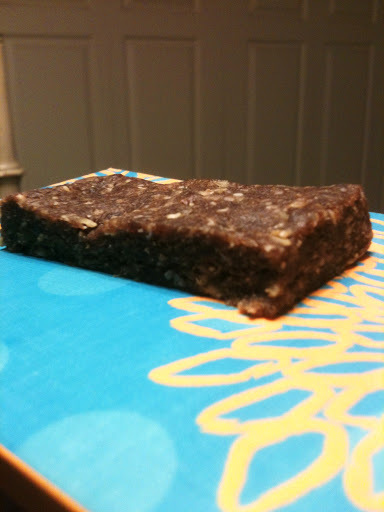 I love making my own snack bars, but sometimes it is very difficult to make bars that are portable. Even though I have made bars before that I individually wrapped, if I didn’t eat them straight from the fridge or freezer they would fall apart. That is not the case with this bar. I stored these in the fridge, but I took it as a snack during work and I was surprised at how well the bar not only stayed together, but was still firm! 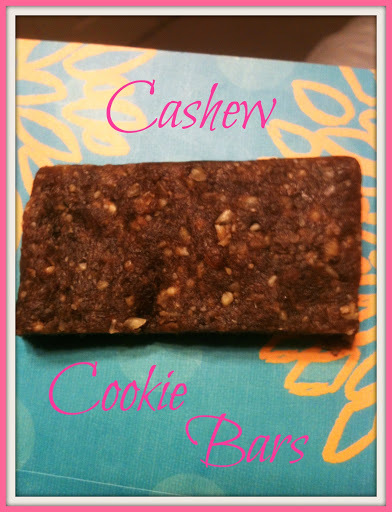 When I first made these bars, I was a little nervous as to whether or not I would like them since cashews are my least favorite nut. However, they had an amazing taste, especially paired with the cinnamon spice. I am a huge fan of cinnamon! In a food processor add cashews, hemp seeds, salt, cinnamon, and oats and process until crumbly. Add dates and vanilla and process until well-combined and a sticky dough forms. Add the coconut and chocolate chips and process for a few more seconds. Remove the dough and press into an 8×8 pan. Refrigerate for at least an hour or until chilled. Remove from fridge and cut into 6 bars and wrap each individually in wax paper. Store each wrapped bar in a ziplock bag in the fridge until ready to eat. *I recommend soaking the dates in warm water for at least 30 minutes before mixing in the food processor so they are soft and mix with the other ingredients better. Alternatively, you can heat them in the microwave for about 30 seconds to help soften them. You can also turn this dough into bite sized snack balls instead of bars. This recipe makes 6 bars. One bar yields approximately 202 calories and 4.5g protein. Lately when I have been making smoothies, I have been making them so thick that they can be eaten out of a bowl with a spoon with some granola, nuts, or chopped fruit on top to add some crunch. However, tonight I was craving a smoothie that could be sipped out of a glass with a straw. I still wanted a thick smoothie because sometimes smoothies that are too thin can go down way too fast and I really wanted something that would last and have some staying power. I knew if I used a frozen banana I would have a great base for a creamy, thick shake. I also decided to use some almond yogurt in place of almond milk since yogurt has a creamier, thicker consistency than almond milk. Cocoa powder and almond butter added to this shake by giving it flavor, protein, and some staying power. Not only are these ingredients all packed with nutrition, but when combined they make for a very tasty treat! This smoothie can be enjoyed pre or post workout, as a regular snack, as a dessert, or doubled and maybe blended with some oats to be more filling for a meal replacement smoothie. Process until smooth and creamy, without overblending. I know there are tons of recipes for chocolate peanut butter and banana smoothies, but this one was exactly what I was craving and I want to remember the recipe for the future. (I know I’ll be making this again!) I got the thick, creamy smoothie with the perfect amount of sweetness from the banana without any added sugar in any form, not even from extracts or stevia. This recipe can also be easily adapted to suit your cravings. For a thinner shake, add more almond milk. For a thicker shake, add more yogurt or banana. If you like added sweetness, add almond extract (or another kind), stevia, agave, or another sweetener. For more flavor, add extra cocoa powder or almond butter. Try a different kind of nut butter. Turn this smoothie into a Chocolate Banana Smoothie by omitting the nut butter. Turn this smoothie into an Almond Butter Banana Smoothie by omitting the cocoa powder. Double the recipe and maybe add some oats for a meal replacement. Add spinach to sneak in some extra veggies (you won’t even taste the spinach). Omit the almond milk, blend all other ingredients together, and turn this smoothie into frozen yogurt to be eaten out of a bowl. Omit the almond milk and yogurt, blend all other ingredients, and it will resemble soft serve to be eaten out of a bowl. Sorry there is no picture. I didn’t realize I would love this smoothie exactly how I made it and would want to post the recipe. But don’t worry I’ll be making it again soon and will definitely get a picture then. But for now just imagine thick, creamy dark chocolate milk! Based on using original Silk PureAlmond milk, plain Amande Cultured Almondmilk, and Maranatha Natural Almond Butter, this recipe yields approximately 288 calories and 7g protein. Peanut butter goes well with so many fruits. My favorite combination is peanut butter and banana. My second favorite combination is peanut butter and apple. 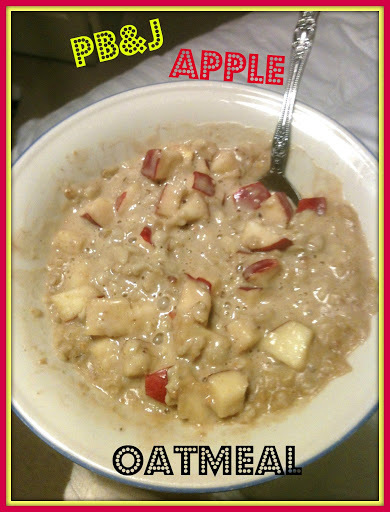 One morning I was trying to decide what oatmeal combination I wanted and was torn between a PB&J Oatmeal or Peanut Butter and Apple Oatmeal. I then had the greatest idea, why not combine the two? The result? A delicious breakfast! In a microwave safe bowl, combine oats, almond milk, and a dash of sea salt and stir to combine. The next morning, reheat oatmeal for 1 minute. Stir in peanut butter, peanut flour, and jam. If you don’t have peanut flour, you can add an extra tablespoon of peanut butter. I used the peanut flour for extra peanut taste (this stuff gives a strong peanut flavor that I love) and for the extra protein. You can get peanut flour at iherb and first time users can use my code LWZ362 for a discount. This recipe yields approximately 310 calories and 10.5g protein. Sweet potatoes are one of my favorite foods. They are great baked as fries, in a savory mexican style dish, or even as a sweeter dish topped with almond butter. 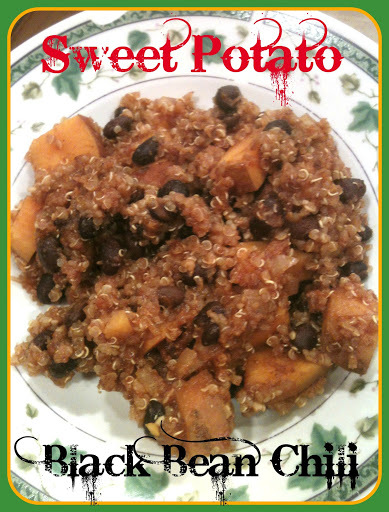 You can also use sweet potato as a replacement for anything that calls for pumpkin. Today I am sharing a delicious savory meal I made on a Sunday. I made it in the crockpot so it was quick and easy and I had a perfect nutrition meal ready for me when I got home from a busy day! 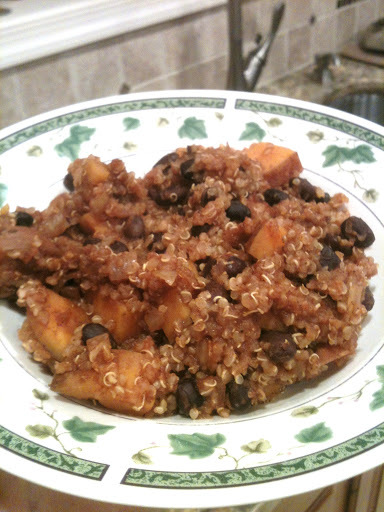 Combine all ingredients except quinoa in a crockpot. Cook over high for 4 hours. Add quinoa. 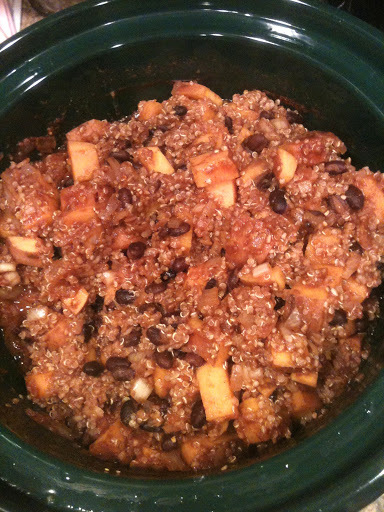 Turn temperature to low and cook for an additional hour or until quinoa absorbs all the liquid. The original recipe actually calls for cumin, and not the cinnamon. But I love cinnamon and think sweet potato and cinnamon go really well together. It definitely did in this chili! Try out my recipe, the original recipe, or play around with your own spices to get the flavors that taste best to you! I am roughly estimating that this recipe makes 8 servings. Based on one serving, this recipe yields approximately 262 calories and 11g protein. Even though Valentine’s Day is practically over, here is a dessert that is perfect for this holiday. Red Velvet seems to be very popular around this time of the year. Unfortunately, many recipes that are named Red Velvet (brownies, cookies, cake, etc.) are usually filled with red dye food coloring. Food coloring can come with a lot of health risks including cancer, birth defects, allergic reactions, hyperactivity, and other behavioral problems. Check out this website for more information. Food coloring is definitely fun to use to turn food vivid fun colors, but it is not worth these health risks. I would much rather color my food naturally. 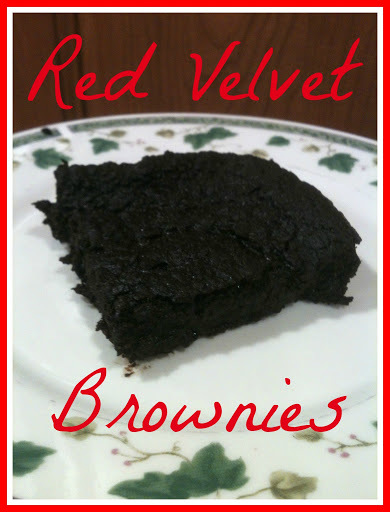 Today I am posting a recipe for Red Velvet Brownies. This recipe uses beets to naturally color the brownies red. 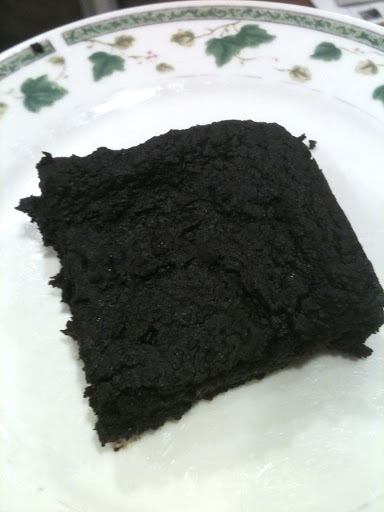 However, my brownies still came out looking like regular chocolate brownies, which I think is either because I used canned beets or it might be because of the amount of cocoa powder used in this recipe. Some people might prefer there brownies to look regular and others might miss that red velvet color. I recommend trying to use fresh cooked beets to get that red color. If that doesn’t work, I’m sure you could try reducing the amount of cocoa powder or maybe leaving it out completely, but then your brownies won’t taste chocolatey. Preheat oven to 350F and spray an 8×8″ pan with cooking spray. Set aside. In a food processor, puree kidney beans and beets. Transfer to a large bowl. Add the remaining ingredients and stir until smooth and well combined. Bake for 40 minutes. The brownies are done when a toothpick comes out slightly clean. These brownies are fudgy! If you don’t like fudgy brownies I guess you can try cooking them a little longer, but I cannot vouch for these results. I like fudgy brownies so I found these to be perfect!I love that these brownies are tasty and you are getting some healthy nutrients. Beans and vegetables in a dessert! And you cannot even taste it! I’ll take that kind of dessert any day. Based on 9 servings, each brownie yields approximately 128 calories and 4g protein. I have been absolutely loving avocado! I love the green color, I love the creaminess, I love the healthy fats, I love that it can be made in sweet and savory meals. Today I have a recipe for a savory meal. I had a 1/2 an avocado left and knew I wanted to use it as a sauce for pasta. This morning I came across this recipe and it was perfect timing. The recipe was a dressing that used avocado. However, the recipe was for a salad dressing, but I was curious if I could turn it into a pasta sauce. With a few changes to the original recipe, I think this sauce came out tasting fantastic and so good that I will definitely be making it again. Spirulina comes in powder form or tablet form. I like the powder form because I usually add it to smoothies. I love adding it to smoothies in the morning, because it really does give you a great burst of energy! Spirulina is not a common household ingredient and it is expensive. 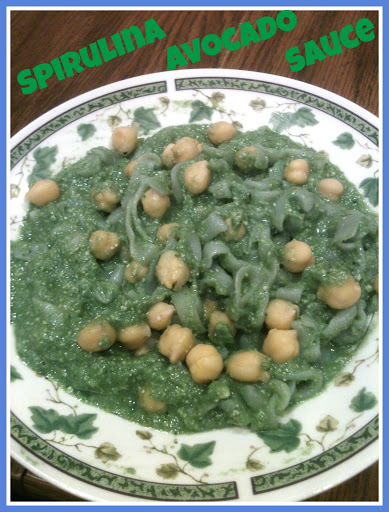 If you do not have spirulina and do not want to spend the money on it, you can leave it out of the recipe, but your sauce will not be as green or filled with as many nutrients. However, if you want extra green color and some added nutrients, I’m sure you could add about 1/2-1 cup of spinach or kale. If you are interested in trying spirulina, I order it online from iherb. If you want to order some, or any other bulk ingredients, if you enter the code LWZ362 at checkout you can receive $10 off your first order if you spend more than $40 or you can receive $5 off your first order if you spend less than $40. Spirulina is packed with nutrients and is best consumed in raw form, which means it is best in cold things like smoothies. This means that if you like a hot pasta, this meal may not be best for you. Trust me, you don’t want to heat spirulina, it turns brown and doesn’t even taste good after being heated. If you want though, you can try to heat your pasta so the pasta itself is extremely hot, then stir in the cold sauce and you’ll end up with a warm/cool pasta. If you love hot pasta, but are willing to try warm/cool instead of completely cold, this may be a good option for you. So now that you have some options about using spirulina (or not) here is how I made my Spirulina Avocado Sauce which has been adapted from Choosing Raw. Once your sauce is made you can add it to pasta, brown rice, spaghetti squash, etc and then add any other toppings you want. I added chickpeas to my pasta dish! I was in the mood for a really saucy dish so the noodles are basically hidden under the sauce. I used the entire recipe for my noodles, but the sauce really serves 2-3 people. This picture does not do the bright, green color of the sauce any justice. It was a brilliant green color in person. Based on using a small avocado, medium zucchini, and original Silk PureAlmond milk this entire recipe yields approximately 261 calories and 10g protein. I made the best oatmeal this morning. It was so creamy and tasted like cheesecake! I even almost called this Banana Cheesecake Oatmeal, but went with Banana Yogurt Oatmeal instead since it isn’t really cheesecake and thought yogurt was more true to the name of the oatmeal. As I decided on what to add to my oats this morning I knew I wanted something creamy. 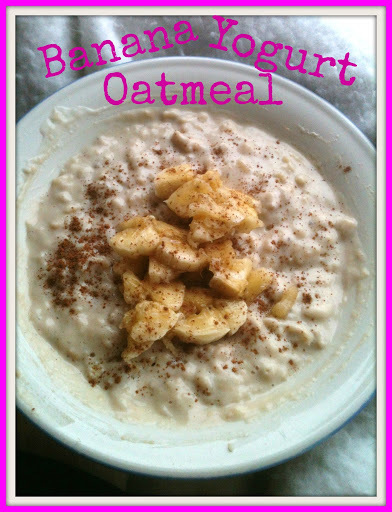 I love creamy oatmeal and knew that yogurt would be the perfect ingredient. I also love adding a fruit, and usually that fruit is a very ripe mashed banana for the natural sweetness and additional creaminess the mashed banana gives to the oats. Finally, I wanted some vanilla flavoring as well and thought what better way to add vanilla and protein to my oats so I added some of my favorite protein powder, Sunwarrior Blend Raw Vanilla Protein Powder. Combine oats, almond milk, and sea salt in a bowl overnight. The next morning, heat for 1 minute. Stir in yogurt, banana (I left about 1/4 unmashed and added the slices as a topping), and protein powder. Stir until combined. Top with banana slices and cinnamon, if desired. I’m sure this would also taste amazing with peanut butter drizzled on top. I actually debated adding some to my bowl this morning, but I’m glad I didn’t because I don’t think the banana flavor would have been as intense. I will most likely try this with peanut butter another day this week though because I love the combination of banana and peanut butter together. Based on using Trader Joe’s Gluten Free Rolled Oats, original Silk PureAlmond milk, Amande Plain yogurt, and Sunwarrior Blend Raw Vanilla Protein Powder, this recipe yields approximately 290 calories and 13g protein. 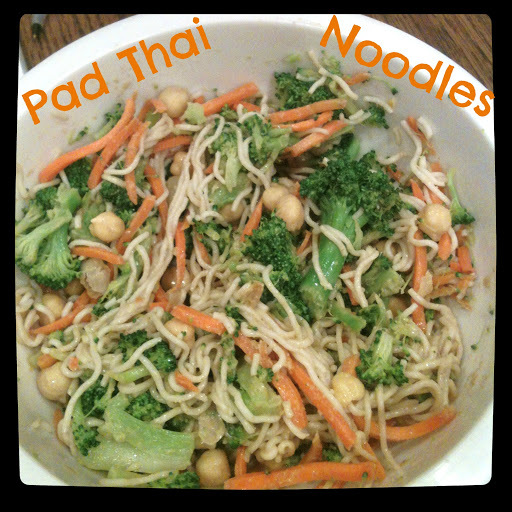 Here is a great, tasty meal for when you want something spicy and full of nutrients. 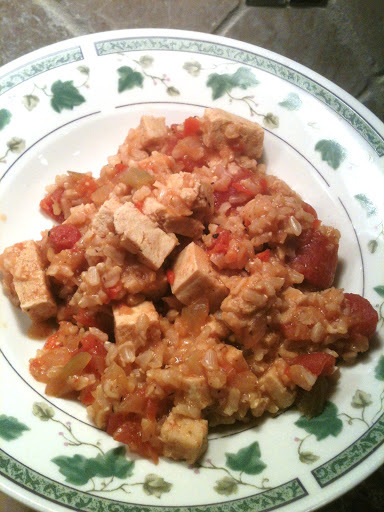 This jambalaya is packed with veggies, healthy carbs from the brown rice, and the tofu packs tons of protein! It is also a very easy and quick meal to make and leftovers are just as delicious the next day! Cut the tofu into 1/2 inch cubes. Set aside. In a large pot, saute onion, bell pepper, and celery over medium-high heat until soft. Add rice and garlic and cook for about 2 minutes while stirring. Add tomatoes, water, and all seasonings and stir to combine. Cover the pot tightly and turn heat to low. Cook for about an hour or until rice is done and the liquid is absorbed. The original recipe recommends using white rice because it cooks faster. I prefer brown rice, though, and I can wait an extra 30 minutes while it only simmers; it is not like I had to do any extra steps for the brown rice. But I guess if you are in a rush, you should use the white rice and you will only need 1/2 cup of water instead of 1 cup. 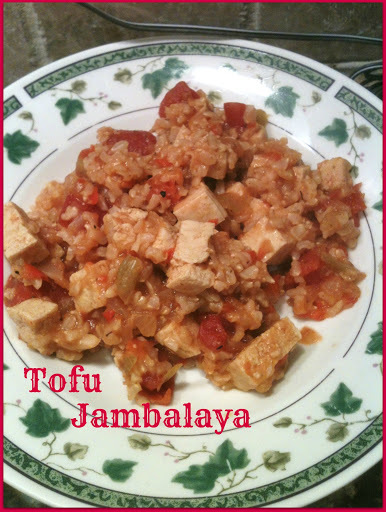 Also, if you want to make this more like regular jambalaya that is more “meatier” than tofu, you can probably use vegan sausage in place of or in addition to the tofu. Besides chopping all the vegetables, this meal came together very quickly. And here’s a tip, to quickly chop all the vegetables, I added them all to a food processor and pulsed a few times. Then, once everything is mixed together in the pot, there is really nothing more to it! I am roughly estimating that this recipe makes about 8 servings and each serving yields approximately 175 calories and 8.5g protein. Last night I was in the mood for a yogurt bowl as an evening snack and I love adding fruits and muffins to my yogurt bowl. 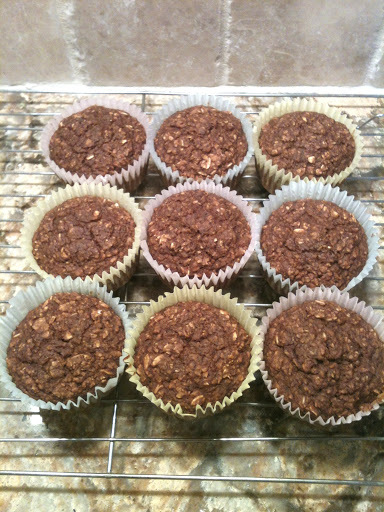 I dug into my freezer and found that I had these Gingerbread Oat Muffins saved from when I made them over the holidays. That is what I love about muffins, you can freeze them and they stay so fresh. I just let it thaw out and reheated it in the microwave for a few seconds and it tasted just as fresh as before. Preheat oven to 350F and spray a muffin tin with non-stick spray or line the muffin tin with cupcake liners. In a large, combine the dry ingredients. In a separate bowl, mix together the almond milk, banana, and molasses. Combine the dry ingredients with the wet ingredients and stir well. Fill the muffin tins so they are about 2/3 full. Bake for 13-15 minutes. Allow to cool for a couple of minutes before removing from the pan. With this recipe, I was able to make about 9 muffins. If you want to store these, or any type of muffin, what I do to keep them the freshest is wrap them individually in saran wrap. Then, I place them all into a gallon sized ziploc bag and store them in the freezer. When I want one, I take one out of the freezer and let it sit on the counter until it is thawed. However, if you want to eat it immediately, reheat it in the microwave, oven, or a toaster oven will probably work really well. 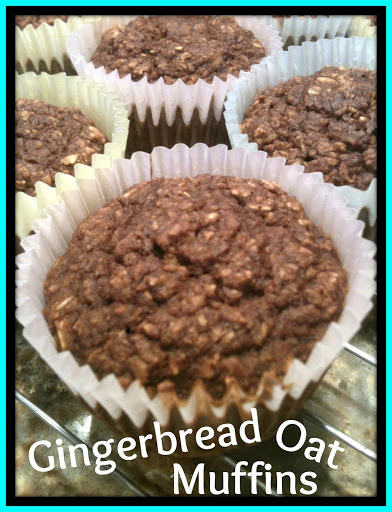 Based on making 9 muffins using Bob’s Red Mill Gluten Free Rolled Oats and original Silk PureAlmond milk, this recipe yields approximately 111 calories and 2.5g protein.